It’s that time of year again! 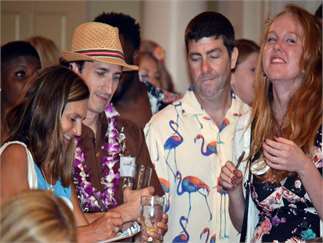 Ditch the evening gown and black tie in favor of a sundress and Hawaiian shirt for this year’s annual FinFest Gala on Saturday, May 18, 2019 at the Timuquana Country Club! At this beachy blast, you’ll enjoy live entertainment from Top Secret Band, delicious food and drinks, as well as a silent auction stocked with exciting items. The evening’s festivities will be led by FinFest Chairs Matt & Seana McAfee and emceed by Katie Jeffries of First Coast News. Other notable guests include Honorary Chairs Peter & Nancy Bragan, Jr.; Artis & Enola Gay Gilmore; Mark & Samantha Lowery; and Tom & Kathy VanOsdol.All proceeds from FinFest 2019 directly fund the mission of Jacksonville Speech & Hearing Center: to provide the highest quality professional and compassionate care to all individuals in our community with speech, language or hearing disorders, regardless of ability to pay. 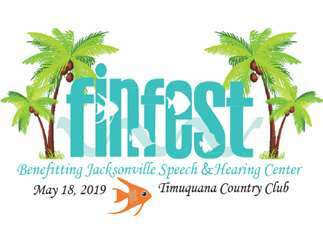 Last year, funds raised from FinFest helped us to serve 3,649 patients within our community, more than 50% of whom required subsidized services due to being uninsured, underinsured, and underserved.Your attendance and participation at FinFest 2019 will help us continue to recognize the communication needs of Northeast Florida!